For other uses, see Perak (disambiguation). Perak (Malay pronunciation: [peraʔ]; Jawi: ڤيراق; Chinese: 霹雳 Tamil: பேராக்), also known by its honorific Darul Ridzuan or "Abode of Grace" (Arabic: دار الرضوان‎, Dār al-Riḍwān), is one of the thirteen states of Malaysia, and the fourth-largest one. It borders Kedah at the north; Thailand's Yala Province to the northeast; Penang to the northwest; Kelantan and Pahang to the east; Selangor to the south, and the Straits of Malacca to the west. The state's administrative capital of Ipoh was known historically for tin-mining activities until the price of the metal dropped, severely affecting the state's economy. The royal capital, however, remains at Kuala Kangsar, where the palace of the Sultan of Perak is located. The state's official name is Perak Darul Ridzuan. Perak means silver in Malay, which is probably derived from the silvery colour of tin. In the 1890s, Perak, with the richest alluvial deposits of tin in the world was one of the jewels in the crown of the British Empire. However, some say the name comes from the "glimmer of fish in the water" that sparkled like silver. Darul Ridzuan is the state's Arabic honorific (Arabic: دار الرضوان‎, Dār al-Riḍwān), and can mean either "land" or "abode" of grace. The modern history of Perak began with the fall of the Malacca Sultanate. Raja Muzaffar Shah, the eldest son of the last Sultan of Melaka, Sultan Mahmud Shah and his Queen Tun Fatimah, fled the Portuguese conquest of 1511 and established his own dynasty on the banks of the Sungai Perak (Perak River) in 1528 (his younger brother, meanwhile, followed their mother Queen Tun Fatimah to the south to establish the Sultanate of Johor in the same year). Being rich in tin ore deposits, the dominion was under almost continuous threat from outsiders. The Dutch attempted to control the tin trade in the 17th century, and built defensive forts at the mouth of the Perak River and on Pulau Pangkor. Early history recorded the arrival in Perak of the Dutch in 1641, when they captured the Straits of Malacca and controlled tin-ore and spice trading. However, the Dutch attempt to monopolise the tin-ore trading in Perak by influencing Sultan Muzaffar Syah failed. They then turned to Sultanah Tajul Alam Safiatuddin, the Sultan of Aceh, to seek permission to trade in Perak, which forced the Sultan of Perak to sign a treaty, allowing the Dutch to build their plant in Kuala Perak on 15 August 1650. This did not go down well with the aristocracy of Perak. In 1651, Temenggung and the people of Perak attacked and destroyed the Dutch plant. The Dutch were forced to leave their base in Perak. The Dutch sent a representative to Perak in 1655 to renew the earlier agreement and to seek compensation for the loss of their plant. The Perak government however did not honour the treaty and was thus surrounded by the Dutch; in retaliation, the people of Perak, Aceh, and Ujung Salang, launched a surprise attack on the Dutch. In 1670, the Dutch returned to Perak to build Kota Kayu, now known as Kota Belanda ("Dutch Fortress"), on Pangkor Island. Perak agreed to the construction because of news that the Kingdom of Siam would be attacking the state. Nevertheless, in 1685, Perak once again attacked the Dutch on Pangkor Island, forcing them to retreat and close their headquarters. The Dutch attempted to negotiate for a new treaty, but failed. In the 19th century, the Bugis, Acehnese, and the Siamese all attempted to invade Perak, and only British intervention in 1820 prevented Siam from annexing Perak. Although the British were initially reluctant to establish a colonial presence in Malaya, increasing investment in the tin mines brought a great influx of Chinese immigrants, including Foo Ming, who formed rival clan groups allied with Malay chiefs and local gangsters which all fought for control of the mines. The Perak Sultanate was unable to maintain order as it was embroiled in a protracted succession crisis. In her book The Golden Chersonese and The Way Thither (published 1892 G. P. Putnam's Sons), Victorian traveller and adventurer Isabella Lucy Bird (1831–1904) describes how Raja Muda Abdullah (as he then was) turned to his friend in Singapore, Tan Kim Ching. Tan, together with an English merchant in Singapore, drafted a letter to Governor Sir Andrew Clarke which Abdullah signed. The letter expressed Abdullah's desire to place Perak under British protection, and "to have a man of sufficient abilities to show (him) a good system of government." In 1874, the Straits Settlements governor Sir Andrew Clarke convened a meeting on Pulau Pangkor, at which Sultan Abdullah was installed on the throne of Perak in preference to his rival, Sultan Ismail. This Pangkor Treaty also required that the Sultan of Perak accept a British Resident, a post granted wide administrative powers. In 1875, various Perak chiefs assassinated the British Resident James W. W. Birch, resulting in the short-lived Perak War of 1876. Sultan Abdullah was exiled to the Seychelles, and the British installed a new ruler. The new resident, Sir Hugh Low, was well-versed in the Malay language and local customs, and proved to be a more capable administrator. He also introduced the first rubber trees in Malaya. Perak joined Selangor, Negeri Sembilan and Pahang to form the Federated Malay States in 1896. However, the British Resident system persisted until the Malayan Union was established in 1948. Perak (as a component of the Federation of Malaya) gained its independence from the British on 31 August 1957. Under the laws of the Constitution of Perak, Perak is a constitutional monarchy, with a constitutional hereditary ruler. The current Sultan of Perak is Sultan Nazrin Muizzuddin Shah, the 35th Sultan of Perak. He was appointed as the new Sultan on 29 May 2014. The preceding Sultan was Sultan Azlan Muhibbuddin Shah, who was the ninth Yang di-Pertuan Agong of Malaysia and formerly the Lord President of the Supreme Court of Malaysia who died on 28 May 2014. The Perak State Legislative Assembly (Malay: Dewan Undangan Negeri Perak) is the unicameral state legislature of the state of Perak. It is composed of 59 members representing single-member districts throughout the state. Elections are held no more than five years apart. The current Menteri Besar (Chief Minister) is Ahmad Faizal Azumu who is representative of the Pakatan Harapan, the governing political party that commands the support of majority of members of the State Legislative Assembly. Following the opposition coalition winning Perak in the 2008 general election, Mohammad Nizar Jamaluddin of Pan-Malaysian Islamic Party (PAS) was appointed as the new Menteri Besar (Chief Minister) of the state eventually, although the Democratic Action Party (DAP) won the most seats compared to other opposition parties. The Menteri Besar did not come from the Chinese-dominant party as the state constitution states that the Chief Minister must be a Muslim, unless the Sultan specially appoints a non-Muslim Chief Minister. As DAP does not have any Muslim assemblymen, if the Sultan insists that the Chief Minister must be a Muslim, then the assemblymen would have to come from either Parti Keadilan Rakyat (PKR) or PAS, which formed the coalition state government with DAP. 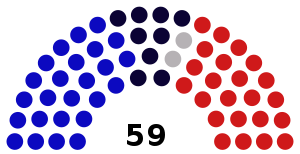 On 3 February 2009, Barisan Nasional, the national ruling party, gained control over the state government, after the defections of three Pakatan Rakyat assemblymen. However, several cases have been filed in the Kuala Lumpur High Court challenging the validity of the new Barisan Nasional government, causing a constitutional crisis. Adding to this crisis is the fact that the Pakatan Rakyat Menteri Besar has refused to resign and states that he is still the legal Menteri Besar until he is removed through vote of no confidence or snap election. Districts of Perak. The borders of Muallim district is based on the borders of the mukims Slim, West Hulu Bernam and East Hulu Bernam that make up the new district. The border between Selama and Larut and Matang is also shown. Perak is divided into 12 administrative districts which are further divided into local administrative Municipal councils. The following is a list of the 12 administrative districts in terms of population. It has been announced on 26 November 2015 that Perak would have its eleventh district, which is called Muallim, which includes the sub-district of Tanjung Malim which has split it from the current Batang Padang District. It has been officiated by Sultan Nazrin, the current Sultan on 11 January 2016. On 9 January 2017, Sultan of Perak Sultan Nazrin Muizzuddin Shah graced the proclamation of Bagan Datuk as the 12th district of the state. The proclamation marked the start of transformation for the district, which is one of the biggest coconut producers in Malaysia. In February 2009, Barisan Nasional retook Perak State Assembly from the Pakatan Rakyat government, after the defections of Hee Yit Foong (Jelapang), Jamaluddin Mohd. Radzi (Behrang) and Mohd. Osman Jailu (Changkat Jering) to Barisan Nasional as independent assemblymen. The Sultan of Perak dismissed the Pakatan Rakyat government but refused to dissolve the state assembly and thus trigger new elections. Amid multiple protests, lawsuits and arrests, a new Barisan Nasional-led State Assembly was sworn in on 7 May, but the takeover was ruled illegal by the High Court in Kuala Lumpur on 11 May 2009, restoring power to the Pakatan Rakyat. However, immediately on the next day, the court of appeal suspended the judgement of the High Court in Kuala Lumpur pending a new judgement from the court of appeal, and followed by 22 May 2009, the Court of Appeal overturned the High Court's decision and returned power back to the Barisan Nasional. Many supporters of the opposition party, DAP, claim that the crisis was effectively a 'power grab'. Once Malaysia's most populous state, Perak has yet to recover from the decline of the tin-mining industry. The economic downturn resulted in massive manpower drain to higher-growth states such as Penang, Selangor and Kuala Lumpur. In 2010, the religious make-up of residents in Perak was: 55.3% Muslim, 25.4% Buddhist, 10.9% Hindu, 4.3% Christian, 1.7% Taoists or followers of other Chinese folk religion, 1.5% other religion or unknown affiliation, and 0.9% non-religious. Statistics from the 2010 Census indicate that 83.7% of the Chinese population in Perak are identified as Buddhists, with significant minorities of adherents identifying as Christians (9.2%), Chinese folk religions (5.8%) and Muslims (0.2%). The majority of the Indian population are as Hindus (87.6%), with a significant minorities of numbers identifying as Christians (6.1%), Muslims (2.67%) and Buddhists (1.0%). The non-Malay bumiputera community are predominantly Atheists (28.2%), with significant minorities identifying as Muslims (24.1%) and Christians (22.9%). All Malays are necessarily Muslims as the Article 160 of the Constitution of Malaysia defines professing Islam as one of the criteria of being a Malay. Like most parts of Malaysia, Perak is a multi-ethnic state with diverse racial backgrounds. Because of this diversity there are also diverse linguistic variety as well. The Malays of Perak speak a variety of dialects or closely related languages, the most common are Perak Malay which is known for its "e" sound (e as in r"e"d, [e]) and the "r" sound which sounds like French "r" ([ʁ]), Perak Malay is commonly found in central Perak, more specifically in Kuala Kangsar and Perak Tengah districts. Northern Malay variety is spoken mostly in northwestern parts of Perak, especially in Kerian, Pangkor Island and Larut, Matang and Selama districts. In the northeastern part of Perak (Hulu Perak) and some parts of Selama and Kerian, the Malay people speak a distinct variant of Malay language which is known as Basa Ulu/Grik (named after Grik) and is most closely related to Kelantan-Pattani Malay in Kelantan and southern Thailand due to geographical borders and historical assimilation. This variant is occasionally classified as a sub-dialect of Yawi. The district of Hulu Perak once was ruled by the Sultanate of Kingdom of Reman. Reman was historically a part of Greater Pattani (which is now a province of Thailand) before gaining independence in 1810 from the Pattani Kingdom via a rebellion by the Royal Family. While in the southern parts of Perak (Hilir Perak and Batang Padang) and also in the districts of Kampar and Kinta and several parts of Manjung, the dialect is heavily influenced by southern Malay dialects of the peninsula such as Selangor, Malacca and Johore-Riau Malay and various languages of Indonesian archipelago namely Javanese, Banjar, Rawa (a variety of Minangkabau), Batak (Mandailing) and Buginese as a result of historical immigration, civil war such as Klang War and other inevitable factors. Due to diverse backgrounds of Chinese community in Perak, they speak a number of diverse dialects and closely related languages that continued to be spoken even to this day. Chinese dialects that are spoken in Perak includes Cantonese, Hakka, Mandarin, Teochew, Hokkien, and Hokchiu. Most Chinese can speak Standard Malay and English as well. Majority of the Indian community in Perak is of Tamil ethnicity and speak a Malaysian dialect of the Tamil language. Other South Indian communities too exist in Perak. The Malayalees in Perak are mostly from Sitiawan, Manjung and Sungai Siput, Kuala Kangsar. They speak the Malayalam Language. A Malayalam medium school was known to be operating in the estate nearby Kampung Kati in Sungai Siput around 60 years ago. The Telugu speaking community had settled down in Perak since the 1930's, mainly in Teluk Intan and Bagan Datuk. There are also a small but strong Punjabi Sikh community as well and speak a dialect of the Punjabi language. Although the Indians here are known to have a different mother tongue, the Tamil Language had become a lingua franca among the South Indian communities due to the Tamil speaking people being the majority Indian ethnic group and the representative of the Indians in Malaysia. In addition, the similarities of Tamil Language with other Dravidian languages such as Telugu and Malayalam had made most of the non-Tamil speaking Indian communities to accept Tamil language as a representative of the Indian community in Malaysia. Most of the Punjabis in Perak are known to speak Tamil fluently unlike Punjabis from other states around Malaysia. A small number of Sinhalese people (Sri Lankan people who's their mother tongue is Sinhalese Language) are found in parts of Ipoh. There are several Orang Asli languages spoken within the state, all of them belong to Aslian branch of Austroasiatic languages. These languages are Lanoh, Temiar, Jahai, Kensiu, Kintaq and Semai. There is a 2,000-strong Siamese community in the state, they speak Southern Thai variant and also fluent in Malay and to some extent Chinese languages. Perak covers an area of 21,035 km2 (8,122 sq mi), making up 6.4 per cent of total land mass in Malaysia. It is the second-largest Malaysian state in the Malay Peninsula, and the fourth-largest in the whole of Malaysia. The longest river in Perak is the Perak River (Malay: Sungai Perak), it originates in the mountains at the Perak-Kelantan-Thailand border, and empties into the Strait of Malacca. It is the second-longest river in Peninsular Malaysia, after the Pahang River. Perak's days are warm and sunny, while its nights are cool the whole year through, with occasional rains in the evenings. Temperature is fairly constant, that is, from 23 °C to 33 °C, with humidity often more than 82.3 per cent. Annual rainfall measures at 3,218 mm. Perak was one of Malaysia's wealthiest states during Malaya's colonial period, as much of Malaya's mineral deposits were situated here. The tin industry here subsequently flourished under the auspices of the British fuelled by the ongoing Industrial Revolution then. The global tin industry collapsed in the 1980s, subsequently forcing the closure of many local tin mines concurrently crippling Perak's economy. This turn of events led the local state government to diversify the economy's base towards commodity-based manufacturing. The mid-1980s witnessed a large influx of electronics SMEs from Taiwan to Silibin and Jelapang industrial estates, but these have relocated to China in the 1990s as a result of outsourcing. A local car manufacturing hub called Proton City at Tanjung Malim has been developed with the establishment of state-of-the-art car manufacturing facilities, it is the largest manufacturer of Proton cars. However, the economy has never fully recovered from the decline of the tin industry. Agriculture is also one of Perak's main industries, especially those concerning rubber, coconut and palm oil. Tourism is a growing industry given the state's abundant natural attractions. Perak is set to become the second state (after Kelantan) to introduce the gold dinar and silver dirham as official currency. The Lost World of Tambun theme park is surrounded by a 400-million-year-old limestone mountain, and includes a 175-room hotel. Kuala Kangsar, just 48 km north of Ipoh on the Perak River, is the royal town. It is dominated by three buildings: Istana Iskandariah, Istana Kenangan and the Ubudiah Mosque. The Istana Iskandariah, located on a hill overlooking the river, is the palace of the Sultan of Perak. Istana Kenangan, which was constructed as a temporary residence during the Iskandariah's construction is known for its architecture. The Ubudiah Mosque is an impressive structure topped with a constellation of bright golden domes. Kellie's Castle is located in Batu Gajah. It was built in 1915 and was never completed as the owner William Kellie Smith died in Lisbon, with his widow selling the property and returning to Scotland. The castle is perched on top of a hill in what used to be a rubber estate. The castle was once believed to be haunted, with many secret rooms and a hidden tunnel. Today, it is opened as a tourist attraction. The Gua Tempurung cave is located between Gopeng and Kampar. During peak season, it is packed with locals and tourists. Accessible from Lumut, the Pangkor Island holds a mix of fishing settlements and white beaches decked with rich vegetation. The warm waters are used for swimming and diving. Resorts are available for accommodation on the island. Pangkor's two popular beach areas are Pasir Bogak and Teluk Nipah which offer activities such as scuba-diving, snorkelling, wind-surfing and fishing. Teluk Ketapang (Turtle Bay) still receives turtles on their egg-laying pilgrimages. A white water rafting location in Perak is at My Gopeng Resort (Gopeng). White-water rafting (Grade 3), waterfall abseiling, rafflesia's flower trekking, jungle trekking and others adventures are part of the joy of visiting Perak. Beside rafting, many admire Gaharu from Gaharu Tea Valley Gopeng a kind of Agarwood which can be processed as tea. Rumor has it that whoever captures a picture with the tall King Wood will bring in a windfall. Hong Kong director Raymond Wong Bak-Ming believed had a close relationship with the farm owner. The Belum-Temengor Forest Reserve is one of the largest untouched forest reserves in the peninsula, with exotic mammals such as elephants, rhinoceroses, tapirs and tigers. Guided tours are available for visitors. The Sungai Klah Hot Spring Park has a free-flowing hot springs swimming pool and therapeutic park at the foothill of the Titiwangsa Range, 200 feet above sea level. Visitors can view the oil palm plantations and durian orchards, and also experience hot springs egg boiling. Founded in 1844, Bukit Larut (Maxwell Hill) is the wettest place in Malaysia, with an annual rainfall of over 500 cm. The hill has views on a clear day where the peninsular coastline and the Straits of Malacca are visible, sometimes stretching as far as Penang to the north and Pangkor Island to the south. The Taiping Lake Gardens was built on top of an abandoned tin mine, and opened in 1880, the first public garden in Malaya. Spread over 64 hectares, the lake system has ten lakes and ponds, a lotus pool, bridges, tracks for jogging and reflexology, a roller-skating rink, paddleboat rides, and a playground, all surrounded by tropical plants, flowers, trees and wildlife. The railway service is undergoing major upgrading[when?] with the advent of electrified trains running on double tracks from Kuala Lumpur to Ipoh. Ipoh railway station is in the city centre. Built in the Moorish style, this white structure, nicknamed the Taj Mahal of Ipoh, was completed in 1935 to replace the original railway platform shed built in 1917. The Ipoh railway station is said to be the "second-most beautiful railway station in Malaysia" after the Kuala Lumpur railway station. It is located on Jalan Panglima Bukit Gantang Wahab. There are a number of higher education institutions in Perak. Universiti Tunku Abdul Rahman and Tunku Abdul Rahman University College both have campuses in Kampar. The University of Kuala Lumpur’s MIMET is located at Sri Manjung, while Universiti Teknologi Petronas has its main campus at Seri Iskandar. Perak is also home to the oldest polytechnic in Malaysia, Politeknik Ungku Omar, located in the state capital of Ipoh. Tempoyak is another Malay delicacy. It is durian extract which is preserved and kept in an urn. Commonly eaten with chillies and other dishes, it is well known due to the popularity of its key ingredient, durian, among the locals. Tambun pomelo, the most popular fruit in Perak, is another tropical delight. Rendang Tok, a noted Perak Cuisine, a beef gravy slow cooked in a huge, deep frying pan over bonfire normally served during Malay Muslim festive season Hari Raya Aidilfitri or Malay wedding in Perak. Ipoh, the state capital, is known for a soup noodle dish called sar hor fun and Hainanese chicken rice. Sam Poh Tong Cave Temple in Ipoh. Isabella Lucy Bird. The Golden Chersonese and The Way Thither. (1892). G. P. Putnam's Sons. ^ a b "Laporan Kiraan Permulaan 2010". Jabatan Perangkaan Malaysia. p. 27. Archived from the original on 27 December 2010. Retrieved 24 January 2011. ^ "Perak". Department of Statistics Malaysia. Retrieved 17 July 2018. ^ "British Museum – axe". British Museum. ^ Star Publications (M) Bhd. "Archives". thestar.com.my. Archived from the original on 1 February 2009. Retrieved 12 March 2008. ^ "BASIC POPULATION CHARACTERISTICS BY ADMINISTRATIVE DISTRICTS". Jabatan Perangkaan Malaysia. p. 3. Archived from the original on 28 December 2010. Retrieved 24 November 2010. ^ "Mualim diisytihar daerah baharu". Utusan Malaysia. 27 November 2015. ^ "Muallim rasmi menjadi daerah ke-11 di Perak". Berita Harian. 11 January 2016. ^ "Malaysia court rules opposition runs Perak state". Reuters. ^ Why give Raja Nazrin space? — Lucius Goon Archived 13 June 2012 at the Wayback Machine. The Malaysian Insider. Retrieved on 27 September 2013. ^ "Banci Penduduk". Archived from the original on 2 May 2003. ^ "2010 Population and Housing Census of Malaysia" (PDF). Department of Statistics, Malaysia. p. 36. Archived from the original (PDF) on 5 February 2013. ^ "Laporan Kiraan Permulaan 2010". Jabatan Perangkaan Malaysia. p. iv. Archived from the original on 27 December 2010. Retrieved 24 January 2011. ^ Harding, Andrew. "Chapter 8 - Religion and the Constitution". The Constitution of Malaysia: A Contextual Analysis. Hart Publishing. ISBN 9781847319838. ^ a b c "Perak". malaysia-hotels.net. ^ "Perak Launches Gold Dinar, Dirham End Of Next Month" Archived 29 June 2011 at the Wayback Machine, Bernama News Agency, 25 January 2011. Retrieved 27 January 2011. ^ "Lost World of Tambun defines MICE direction". TTGmice. Retrieved 21 March 2013. ^ "soleilian.com". soleilian.com. Archived from the original on 11 September 2010. Retrieved 24 December 2010. ^ "Kellie's Castle". Tourism Malaysia. Retrieved 22 May 2014. ^ "Pangkor Island". Tourism Malaysia. Retrieved 22 May 2014. ^ "Belum Forest Reserve". Tourism Malaysia. Retrieved 22 May 2014. ^ "Sungai Klah Hot Spring Park". Tourism Malaysia. Retrieved 22 May 2014. ^ "Bukit Larut (Maxwell Hill)". Tourism Malaysia. Archived from the original on 22 May 2014. Retrieved 22 May 2014. ^ "Taiping Lake Gardens". Tourism Malaysia. Archived from the original on 22 May 2014. Retrieved 22 May 2014. Wikivoyage has a travel guide for Perak. Wikimedia Commons has media related to Perak.